The fuels sheet in the model is where certain properties of fuels are set, such as the costs and pollutant emissions intensities of different fuels in different sectors. Cross-sector policies, such as the carbon tax, fuel taxes, and a reduction in BAU subsidies are included on this sheet. We take in BAU fuel costs as input data. 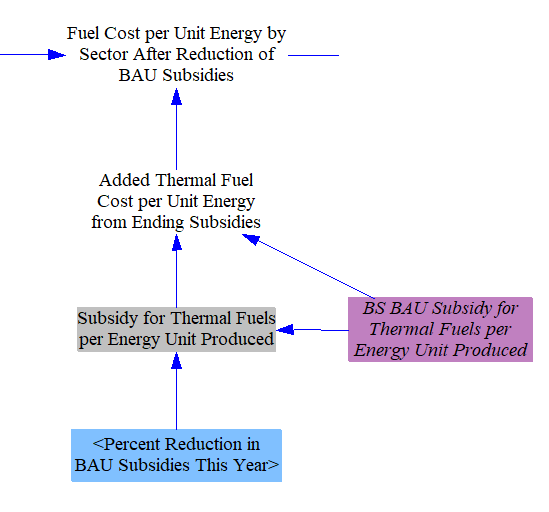 These costs incorporate BAU taxes and BAU subsidies (except for electricity, where only BAU taxes are incorporated, because BAU subsidies for electricity are handled via a different input variable). BAU fuel costs vary by sector in many cases- for example, electricity is charged at a different rate for transportation, residential buildings, commercial buildings, and for industry. These costs are then transferred into a set of five variables, one for each fuel-using sector of the model: transportation, electricity, buildings, industry, and district heating. We manually map these values onto variables for the different sectors because each sector uses its own fuel type subscript (e.g., “Transportation Fuel,” “Buildings Fuel,” etc. ), and we must tell Vensim which fuels (which are members of the “All Fuels” subscript) correspond to those in each of the sector-specific fuel subscripts. The carbon tax is based on the CO2e intensity of different fuels, so we must begin by considering fuels’ pollutant emissions intensities (on the right side of the Fuels sheet). First, we establish the GWP timeframe used for the model. We allow the user to select either 20-year or 100-year GWP values. We default to 100-year GWP values, which are more commonly used in the literature. We assume that if the user chooses to switch to 20-year GWP values, he/she will set other policy levers accordingly. 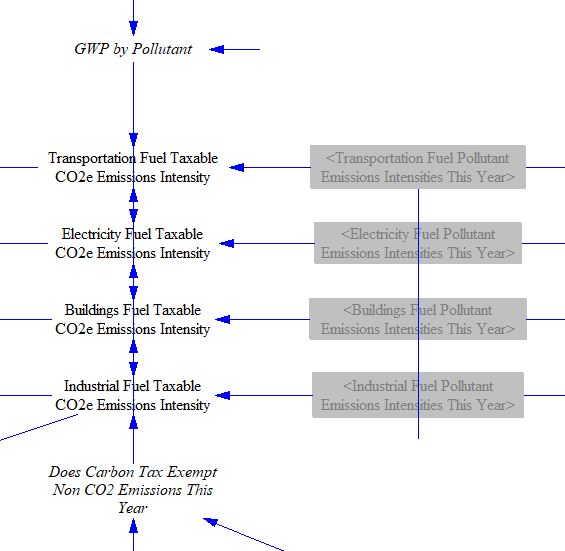 For example, the carbon tax operates per metric ton of CO2e, so if the user switches the GWP timeframe, he/she should keep this new timeframe in mind when choosing his/her preferred carbon tax rate. The GWP timeframe switch affects all model outputs and most internal calculations. In some cases in the Industry sector, we are converting CO2e values from a source document that uses 100-year GWP values; in those cases, we use the 100-year GWP values to do the conversion, irrespective of the user’s setting. Then, when doing final reporting, we convert back to CO2e using the user’s GWP timeframe. We take in emissions intensities for 12 different pollutants, for different fuels burned by different sectors (and further disaggregated by different vehicle types within the transportation sector). These are direct emissions intensities, not lifecycle. Upstream emissions (e.g. from the manufacture or transport of various fuels) should be captured in the Industry (including Agriculture) and Transportation sectors respectively. 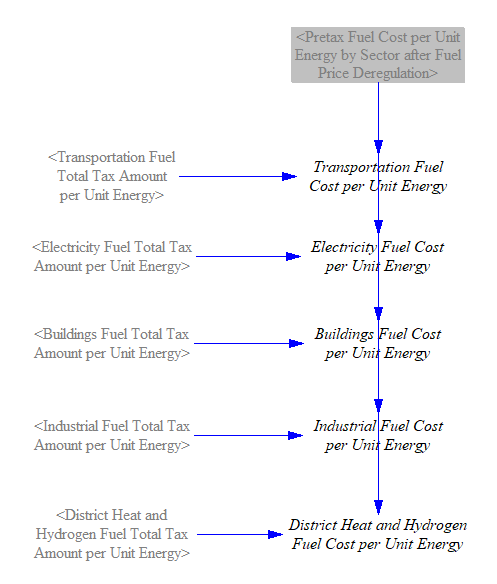 We have already calculated the price of fuels (including taxes) in the BAU and policy cases. However, for purposes of assigning cash flows to particular actors (government vs. fuel suppliers), it is important to know the portion of these prices that consists of taxes.